Welcome to Marvel Strike Force Heroes page. This is the full description of MSF Nebula stats, skills and abilities. Nebula is a relentless Cosmic Brawler who constantly harasses enemies with her fast strikes. Her first skill delivers medium damage but also applies Speed Up to Nebula. Her second skill causes little damage and provides two Counters. Nebula’s ultimate inflicts medium damage to the primary target and can chain to 2 additional targets providing Nebula with two Evades in the process. Passive skill enables her to assist more often and gives her a chance to Revive upon death. Nebula doesn’t seem very strong but her ability to constantly counter and evade and the fact that she is always under Speed Up makes her a formidable opponent – do not underestimate her. 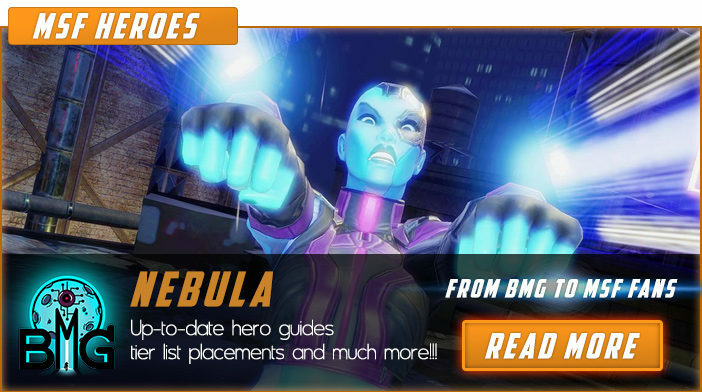 Nebula is available early in the game and her price is 15 shards which can be obtained via premium orbs, 4-9 Heroic Assemble mission, and 1-3 Nexus campaign mission. We hope that you enjoyed the description of MSF Hero Nebula. For detailed information about other MSF Characters check our MSF Heroes page.